WATER mourns the loss of our colleague and great religious leader, Sister Nadine Foley, OP. Below, we share the words of the Adrian Dominican Sisters on the loss of Sister Nadine Foley, originally published here. For much of her religious life, Sister Nadine figured prominently in religious circles as a leader both for the Adrian Dominican Congregation and for women religious throughout the nation. She served for two terms as a General Councilor for the Adrian Dominican Sisters, in 1974-1978 and 1978-1982, before being elected as the Congregation’s Prioress in 1986. During her tenure as Prioress of the Congregation, Sister Nadine was elected to the presidency of the Leadership Conference of Women Religious (LCWR), an association of the leaders of congregations of U.S. Catholic women religious, representing nearly 80 percent of the Sisters in the United States. She also was elected to serve as U.S. delegate to the International Union of Superiors General. A prolific author of articles on religious life, Sister Nadine also was editor of three books, Preaching and the Unordained, Claiming Our Truth, and Journey in Faith and Fidelity; and wrote two volumes of Adrian Dominican history – Seeds Scattered and Grown and To Fields Near and Far – and a biography of the Congregation’s longest-serving Prioress, Mother Mary Gerald Barry, OP: Ecclesial Woman of Vision and Daring. She earned several advanced degrees, including a PhD and MA in Philosophy, as well as an MS in Biology, from Catholic University in Washington, D.C.; and an STM in Scripture from Union Theological Seminary, New York, N.Y.
A native Michigander, Sister Nadine grew up in Newberry in the state’s Upper Peninsula. She entered the Adrian Dominican Sisters in 1945, the same year she earned a Bachelor’s degree in science from Siena Heights College (now University) in Adrian, Michigan. In addition to her many years in Congregational leadership, Sister Nadine taught high school for eight years and ministered for nearly two decades as a professor at several colleges and universities, including two of the Congregation’s institutions – Siena Heights College and Barry College (University), Miami Shores, Florida – as well as Drake University in Des Moines, Iowa, and Marist College in Poughkeepsie, New York. She also served as Visiting Professor of Ecumenical Relations at Harvard University in 1979. Until last year, Sister Nadine served as the Congregation’s historian. Under Sister Nadine’s leadership as Prioress, the Adrian Dominican Sisters focused on personal transformation for the sake of the mission, as well as on social justice issues. The General Council endorsed the sanctuary movement that provided safety for people from Central America fleeing to the United States; promoted the development of the role of women in the Church; and opposed apartheid and racism in South Africa. Sisters who served in leadership with Sister Nadine – whether during her two terms as a General Councilor or her term as Prioress – describe her as effective, highly intelligent and creative, influential in the Congregation and the Church and generous in her service to others. “She was certainly the right person at the right time in terms of carrying the Congregation forward,” said past Prioress Carol Johannes, OP (1978-1982). Sister Carol noted Sister Nadine’s influence as chair of the committee to rewrite the Congregation’s Constitution, which had been approved by the Congregation in 1982. Sister Nadine traveled to Rome several times until the document was finally approved by the Vatican seven years later. Even after her formal leadership role in the Congregation, Sister Nadine continued to be influential through her writing and frequent speaking engagements on topics such as justice issues, spirituality, religious life, and the role of women in the Church. In addition, she was generous in sharing many of her other gifts, including her gift as a vocalist and lyricist. 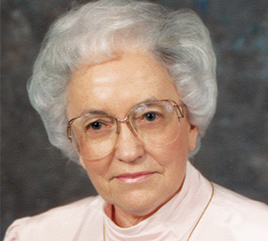 Click here to view Sister Nadine’s obituary and service information.